The FIFA 2010 World Cup in South Africa was more than an occasion for the host country to make money, build new infrastructure or flaunt its economic prowess to the outside world. Dubbed as the ‘first ever football World Cup on African soil’, the event was also envisioned as an occasion to expunge negative stereotypes that have held back the continent for a long time while creating a positive image signalling the continent’s entry into the global community of nations. 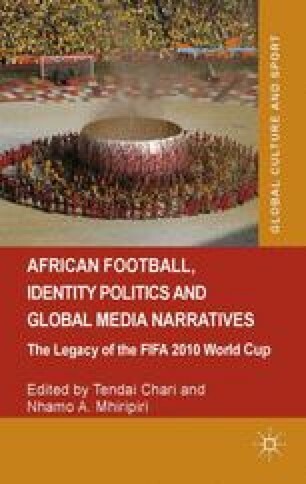 It is instructive to note that the 2010 FIFA World Cup in South Africa was punctuated by discourses that cast aspersions on South Africa’s capability to organize such a complex mega-event. Some sections of the Western media predicted doom and gloom for South Africa, warning about crumbling stadiums and rampant crime, adding that FIFA needed to put in place ‘Plan B’ in case South Africa did not live up to her billing (Gibson, 2010). This Afro-pessimist sentiment was poignantly evident in the Daily Star, a British tabloid, which warned British fans about the possibility of them being caught up in a racial machete war in South Africa (Hughes, 2010). The newspaper further reported that machete-wielding gangs were roaming the streets in South Africa and prospects of a civil war in that country posed a threat to the World Cup. Gibson, O. (2010). World Cup 2010: South Africa leaves a World Legacy to remember. The Guardian (UK) http://www.theguardian.com/football/blog/2010/jul/12/south-africa-world-cup-2010 (accessed 10 October 2013). Hughes, S. (2010). World Cup Machete Threat: England fans could be caught up in machete race war at the World Cup. The Daily Star, 5 April 2010, retrieved from http://www.dailystar.co.uk/news/latest-news/129402/WORLD-CUP-MACHETE-THREAT (accessed 19 September 2013). Mabogoane, M. (2010). World Cup self-praise dishonest. The Sowetan, 6 August 2010, retrieved from http://www.sowetanlive.co.za/columnists/2010/08/06/world-cup-self-praise-dishonest (accessed 16 September 2013). Mathebula, D. (2010). World Cup visitors: Not all Doom and Gloom. Mail & Guardian, 3 June 2010, Retrieved from http://mg.co.za/article/2010–06-03-world-cup-visitors-not-all-gloom-and-doom (acccessed 16 September 2013). The Telegraph (21 October 2009). Germany players to wear bullet proof vests at 2010 FIFA World Cup, http://www.telegraph.co.uk/sport/football/world-cup/6401466/Germany-players-to-wear-bullet-proof-vests-at-2010-World-Cup.html (accessed 15 July 2013).